A Dutch publisher in Amsterdam released this November the first smartphone application containing Anne Frank's diary in its original language. It will cost approximately $8.50 to download. Uitgeverij Prometheus unveiled the Dutch-langauge app at a performance of "Anne" earlier this month at Theater Amsterdam. The theater, a 1,100 seat auditorium, was built several months ago, for the new play about the teenage diarist's life. Not only does the app contain the international bestseller The Diary of a Young Girl in full, but also several unedited versions of writings and diary entries penned by Anne Frank, the publishing house announced in a press release. 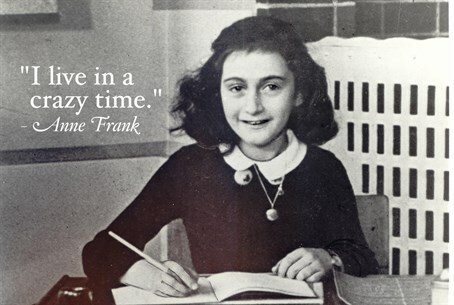 The Diary of a Young Girl is the first version of Anne Frank's diary brought to print by her father, Holocaust survivor Otto Frank. It was first published in France and Germany in 1950. The diary tells the story of the Frank family's two years in hiding in the attic of an office building with another Jewish family, the Van Pels, in Nazi-occupied Amsterdam during World War II. The last entry in the diary, on August 1, 1944, was written several days before the hideout was raided and the Frank family, Van Pels, family, and Friedrich Pfeffer were detained in the Westerbork transit camp. From there they were all deported to various concentration camps. Otto Frank was the only survivor. An unabridged version of the diary, including passages edited out by Otto Frank, was published in 1995. The new application also features two interactive timelines with photographs from World War II as well as the secret annex where the Franks hid. Video interviews with Miep Gies, Otto Frank's secretary, who helped the Franks while in hiding, are also included. Additionally, an audio book version of The Diary of a Young Girl, is read by Carice van Houten, the Dutch actress who plays The Red Woman on the popular HBO series Game of Thrones. The Dutch-language app is the second app to be released that contains the full text of the diary. The first Anne Frank app appeared in English last year. The diary is the intellectual property of the Anne Frank Fonds in Basel, Switzerland, a nonprofit foundation Otto Frank founded in the 1970s. Yves Kugelmann, a board member of the Anne Frank Fonds, stated that the Dutch-language app was produced by a team of 15 individuals. The app “aims to make the Anne Frank story and its context accessible to a new generation of readers."